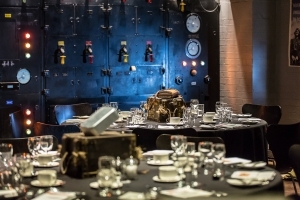 This week our team visited an unusual top secret venue, Churchill’s War Rooms. The actual site is hidden beneath Westminster, where Winston Churchill and his War Cabinet led Britain and her allies to victory during the second world war. 400 guests. After being greeted with delicious canapes from the onsite catering team, we sipped our glass of wine as we enjoyed a private tour of the Churchill Museum, which can be available as part of the event package. As we took a tour through history we also enjoyed leaning about the various event spaces. 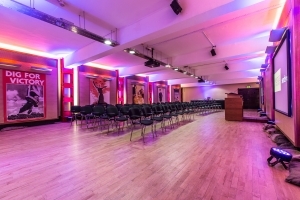 From small intimate meeting rooms to larger spaces suitable for parties or standing receptions, it was surprising to see how this underground space could play host to a variety of events with historical significance in every room. My personal favourite included what’s known as the Switch Room. The Switch Room represents one of London’s most unique new dining spaces. 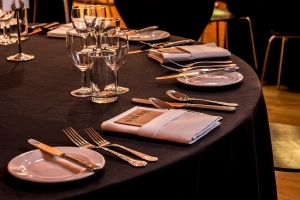 Perfect for smaller, more intimate receptions or a dinner for up to 25 guests. It houses the control panels used to turn off the lights and power for the whole of London during the Blitz. 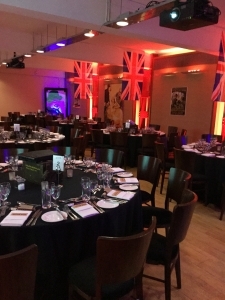 Steeped in History, a perfect venue for foreign guests or for that something a little bit different.